Makeup brush recommendations, in a quickly thrown together format. When starting in makeup I suggest 5 basic brushes to get you going on this awesome vanity filled adventure! First off is your Eyeliner Brush. Now most people stick with pencils but nothing can top a bit of drama with a flat definer brush pushing a bit of a dark color into the lash line. It's a look that can still be wearable by day but with that pop of "Wow, you look great today!" ishness. I also like to use flat definer brushes to smudge out liner that is too harsh for a more demure effect! Second is your powder application brush for eyes.Some brushes that I suggest are the flat shader from Sigma, the Up & Up Smudge brush from Target or any other brush that has a flat stiff brush that can pack color on. Dense bristles will pick up more of the product and patting it will lay that color on exactly where you want it to go. Third, you need a blending brush. 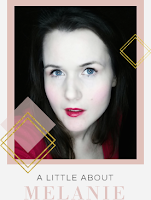 Never forget blending unless you are going for a cut crease, and if you are doing that... you don't need this Brush Primer (psst and email me because I never get it right!). Select a brush with fluffier bristles to impart a more diffused look with your shadows. I use a pointed blending brush for my deep set eyes, but most people can get away with a wider and thicker dome shaped head. If the head is a bit flatter but still fluffy, you can apply shadow and it will look a lot more diffused that if you would have used an application brush. Four...th..uh ly?, You need a blush brush. I recommend a fluffy blush brush with a dome for people who are doing their makeup and aren't too experienced with them. It leaves a diffused finish and is great for the apples of your cheeks. Real Techniques makes an amazing couple of blush brushes and the price point is great. Sigma is pretty fantastic, too, if you prefer natural bristles but that's a personal choice. and Fif...fth..screw it, and number 5, I recommend a big fluffity powder brush and powder puff for application of a setting powder. You apply the setting powder with a puff and then dust off the excess. I really love the Sigma line and the Real Techniques lines, again for those. Cleanup, currently is Isopropol Alcohol 91% and a mesh puff to knock off the color, and then a conditioning spray for my natural brushes. I get mine from The Honest Company. When I wash them with shampoo, I use The Honest Company Shampoo and Body Wash. It's cleansing without being overly drying. The alcohol already dries them out enough! There are more advanced brushes, if you want to know more about those, but I don't want to overwhelm anyone! Basically if you get 5 brushes, you will be golden, and can only go more expert from there. If you are getting brushes, CONGRATULATIONS! I am so proud of you! This is a huge step! Great job! And thanks for sticking with me! 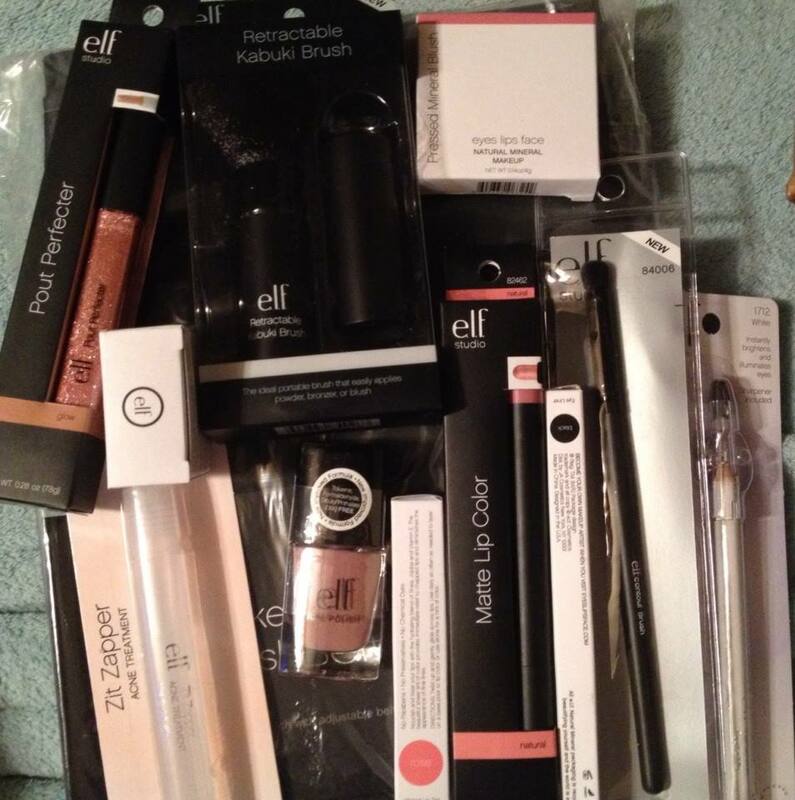 I got my Beauty Bundle from E.L.F and holy crap am I amazed at all the things I received! It is a complete load of awesome. 56 brushes HOLY FREAKING CRAP! 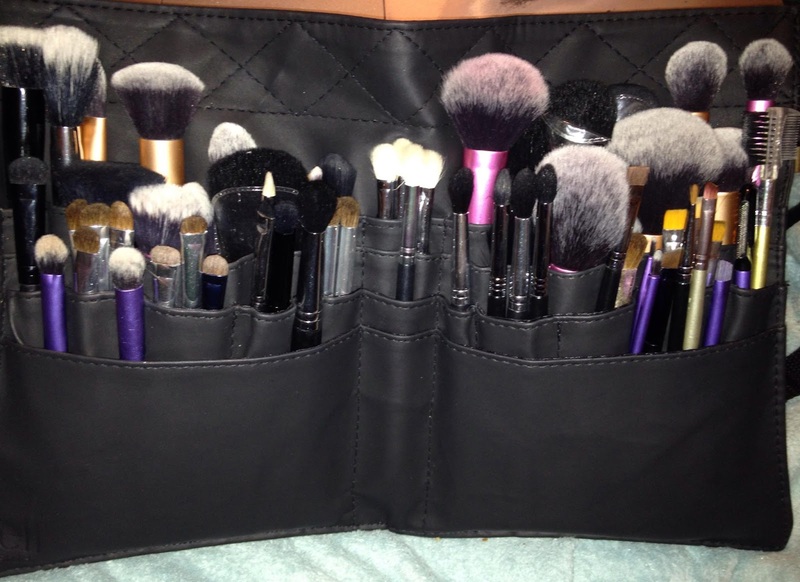 I am completely shocked at how it fit ALL of my brushes. Also kinda freaked me out that i have 56 brushes and yet I am still compelled to buy more. It could fit my 4 travel brushes without even breaking a sweat. So I got $48 USD worth of E.L.F products for $19.95 plus shipping. Most were of the higher end lines like the Studio line and the Mineral line and I would have purchased ALL of these and do not mind getting backups of what I already had. The first month is free, and you add clothes to your closet, and they send you out one outfit at a time. It would be unfair of me to withhold something so awesome from you guys and *hint* I am thinking about another clothing subscription service as well. Here's the LINK and have fun picking out your outfits to wear that are chic and flattering! With designers like Calvin Klein, Michael Kors, and amazing shops like Three Dots, DKNY and ABS, beautiful clothes are all over the place. It's amazing. I am adding some knit dresses and some tunics to my closet. What clothes would you add to your Gwynnie Bee Closet?